THERE’S A NEW RIDE IN TOWN! Knoxville, Tenn. – Knoxville is known as a “Bicycle Friendly Community,” and a new program makes rental bikes available at multiple locations downtown to take advantage of that friendliness in the city center. Legacy Parks Foundation, Regions Bank, Billy Lush Board Shop, and Visit Knoxville have partnered to provide Get Out & Play! bike rentals at the Outdoor Adventure Center and the Knoxville Visitors Center beginning today. “Legacy Parks is really excited to offer this new rental program. We have such a bikable city, and these two locations provide access to greenways, parks, the river, UT, and many points of interest in the downtown core. It is a great collaboration,” said Carol Evans, Executive Director of Legacy Parks Foundation. 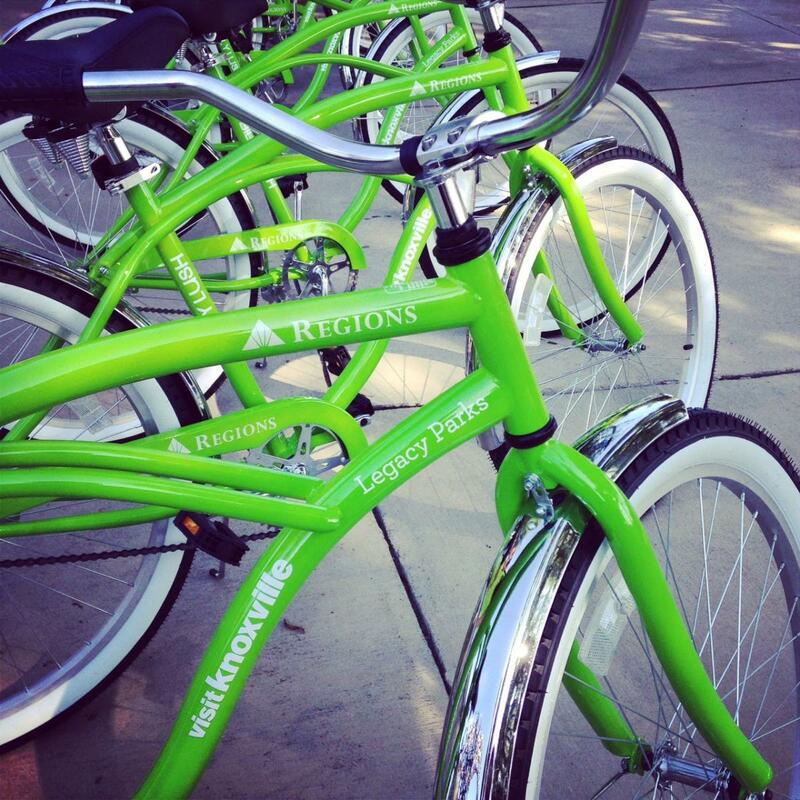 Regions Bank donated eight of their signature green bikes for the Get Out & Play! program. Four will be stationed at the Outdoor Adventure Center (900 Volunteer Landing Lane) and four at the Visitors Center (301 S. Gay Street). Rentals are managed online at local.billylushbrand.com or on site at the Outdoor Adventure Center and the Visitors Center. “Regions is proud to partner with Legacy Parks, Visit Knoxville, and Billy Lush Board Shop on such an enjoyable and beneficial program for our community. Now the citizens of Knoxville and visitors to Knoxville can tour our beautiful city by bike and see what makes Knoxville so special," added Kevin Crateau, Regions Bank Marketing Director. A new map created for the program outlines three distinct routes in the downtown area and highlights interesting locations along the way. “Our greenways link so many beautiful parts of our city and this bike program will provide our visitors with a fun, affordable way to experience them. We are thrilled to be a partner on this project and look forward to expanding it in the coming months,” said Visit Knoxville president Kim Bumpas. Two-hour bike rentals cost $19 for adults, $15 for teachers and military personnel, and $12 for youth under 17. Friends of Legacy Parks receive a 50% discount. Rentals include the bike with lock, the new map, and for the first 100 renters - a Regions Bank backpack to carry supplies. Downtown businesses that want to provide bike racks should contact jlivengood@cityofknoxville.org or call 865-215-6100. Any location that would like to encourage riders to visit may contact Legacy Parks for a Get Out & Play sticker. For more information or to rent a bike, please call the Billy Lush Board Shop at 865-322-5874, or go online to local.billylushbrand.com. Legacy Parks Foundation, an East Tennessee non-profit organization, works to ensure that our community enjoys exceptional recreational opportunities, natural beauty, and open spaces and that those assets exist for generations to come. We work collaboratively to preserve our area’s extraordinary natural resources and to expand parks, trails, and greenways.